After more than 20 years and over 1 million cleanups of Colorado yards and properties, we’ve answered a lot of questions about Scooping Poop. We’ve put our collection of the most commonly asked questions here for you. If you have a question that we did not show here, please use the contact page and ask away! Chances are someone else has the same question. Why hire Pet Scoop Services? We are Colorado’s Preferred Pooper Scooper Business. We have been doing pet waste removal in the Denver Metro area since 1994. Our staff is committed to providing you with professional, caring pooper scooper service at an affordable rate. We can help you to provide a clean, healthy environment for your family and pets. Start enjoying your yard and pets again by simply calling us at 303-781-7667 or signing up HERE and you can become one of our many satisfied clients; we Guarantee it! Do you make sure my dogs don’t get out of the yard? We are very conscientious about making sure that gates are firmly secured while in the yard and when leaving. We take extra care to make sure that your dog stays in the yard while we enter and exit the yard. Is there an extra charge for the first dog waste cleanup? The Initial Cleanup (1st cleanup) is usually a little more than recurring service and is based on how long since last thoroughly cleaned and # of dogs. If it has been awhile since the yard was last cleaned and there is a large amount of accumulated dog waste that needs to be cleaned up, an initial dog waste cleanup fee will apply. We would be more than happy to come out and take a look at your yard and give you a no-obligation estimate or simply enter your information for a Free Quote HERE. How am I charged for the pet waste removal services? We do not require advance payments! We will send you a bill on the first day of each month after services are completed for the previous month. We want you to be completely satisfied in knowing that you received exceptional services before paying for it. We accept checks, most major credit cards, money orders and PayPal. Sign up for our “Monthly Auto Debit” which is a no hassle, automatic monthly credit card payment feature. Click here to make a one-time credit card or PayPal Payment . Click here for our Pricing . How much is pooper scooper service? Pet Scoop offers inexpensive pricing for dog waste removal. The cost depends on the number of dogs, the frequency of dog waste pick up, and the size of the yard being cleaned. 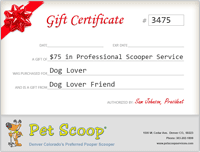 Click on the link below to see Pet Scoop’s pooper scooper pricing list. If you have any questions about our poop scoop services please call 303-781-7667 or Click here for our Pricing . …in the Colorado area that covers all the Denver-metro areas. We service all areas from Boulder to Castle Rock and Golden to Aurora. If you have any questions about our poop scoop services area please call 303-781-7667 or enter your Zip Code HERE to see if we service your area. Who should hire a professional Pooper Scooper service? …who are unable, unwilling or just want to enjoy their yard and pets without the hassle of dog waste clean up. Those parents with small children who enjoy playing outside or if you use your yard often. Those with physical or visual impairments that find it difficult or impossible to clean your yard. Those who have better things to do than dog poop cleanup. No! You can start and stop your service at any time. There is no minimum service period. Since we started in 1994, we have been committed to building customer loyalty through great service, not long-term contracts. We do have some Terms of Service so you know what to expect. Yes. Pet Scoop Service employees are not allowed to climb or jump over fences. Please have your gate unlocked on your service day or if you would like, we can loan you a lock (at no cost). This will allow us to access your yard and the gate can remain locked without you having to hassle with it or remember to unlock the gate. Will I need to confine or restrain my dog? Not unless your dog is potentially aggressive. Pet Scoop waste techs love dogs and really enjoy spending time with them! In fact, “Passion for Pets” is one of our Core Values. However, they also love their fingers, so if your dog is aggressive, we will have to ask you to restrain or confine your dog. Please contact us about your situation if there is any question about your dog’s temperament. Do you do dog poop removal all year, including winter? Yes! We offer pet waste cleanup and removal all year. Snow or inclement weather may delay our professional pooper scoopers from time to time, but we are usually able to catch up on your scheduled dog waste clean up within a day or two. In the winter, we will occasionally get a snow that may cause us to miss an entire week. In this case, we will credit your account 1/4 the regular fee for the missed cleanup. This is due to the fact that we will still have twice as much dog waste to clean up on the next scheduled visit. If your scheduled day falls on one of these holidays, we will generally try to clean the day before or sometimes the day after the holiday. What about vacation days when I need my service skipped? Call us! or use our Contact Form. Please give us as much notice as possible so we can “skip” that service. If we have at least 24 hours notice and the dog(s) will not be using the yard, then there will be no charge for that “skipped” service. Have a great vacation! What happens if we get another dog? Contact us and we will upgrade your service. We can visit more frequently or we can schedule more pet waste cleanup time on each visit. Please see Poop Scooper Service Fees for multiple dog waste removal rates. Then, contact us about upgrading your pooper scooper service by calling 303-781-7667 or fill out our Contact Us Form. If you are moving within the Denver-Metro area, just give us a call at 303-781-7667 or fill out our Contact Us Form and we can move your service to your new home address. You can then have your pooper scooper service continue smoothly so when you get to your new house, we already have dog waste clean up set up for you. If you have a special person in your life that has a dog, why not give them one of the most thoughtful and unique gifts available. Freedom from scooping dog poop!